Correspondence and reprints to: Professor Warner. Objectives: To determine rates of other atopic manifestations in people with peanut allergy and the prevalence of such allergy in their families. Design: A survey of people with self reported peanut allergy and people referred by their general practitioner for suspected peanut allergy; survey and skin testing of 50 children with reported peanut allergy and their available first degree relatives. Subjects: 622 adults and children with reported, suspected, or known peanut allergy. Main outcome measures: Prevalence of peanut allergy and other allergies in the families of people with peanut allergy. Results: 622 valid completed questionnaires were returned out of the 833 questionnaires dispatched (74.7%). All forms of atopy were both more common in successive generations (P<0.0001) and more common in maternal than paternal relatives (P<0.0001). Peanut allergy was reported by 0.1% (3/2409) of grandparents, 0.6% (7/1213) of aunts and uncles, 1.6% (19/1218) of parents, and 6.9% (42/610) of siblings. Consumption of peanuts while pregnant or breast feeding was more common among mothers of probands aged </=5 years than mothers of probands aged >5 years (P<0.001). 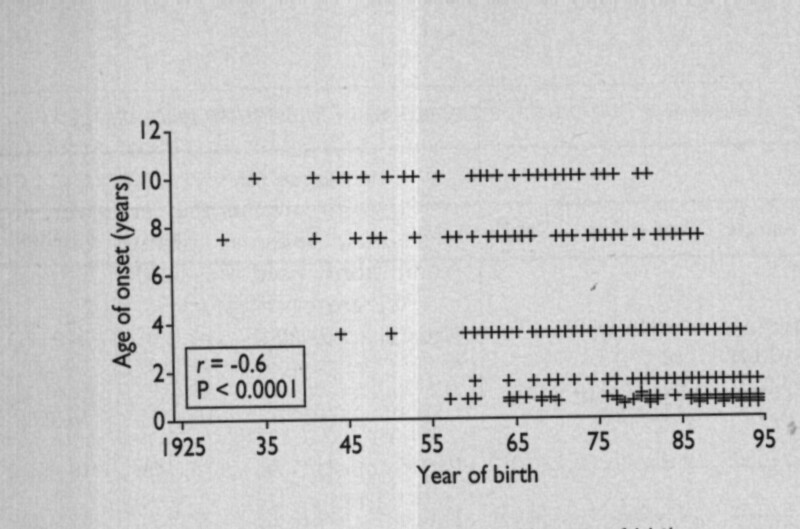 Age of onset correlated inversely with year of birth (r = -0.6, P<0.001). Skin prick testing of 50 children with reported peanut allergy and their families: 7 probands (14%) had a negative result for peanut. Peanut allergy was refuted by food challenge in all those tested (5/7). No parent and 13% (5/39) of siblings had a positive result on skin prick testing for peanut. Two of these siblings had negative challenge with peanuts. The prevalence of peanut allergy in siblings is therefore 3/39 (7%). Conclusions: Peanut allergy is more common in siblings of people with peanut allergy than in the parents or the general population. Its apparently increasing prevalence may reflect a general increase of atopy, which is inherited more commonly from the mother. Peanut allergy is presenting earlier in life, possibly reflecting increased consumption of peanut by pregnant and nursing mothers. To establish whether peanut allergy is more common in the relatives of probands than in the general population (population prevalence of sensitisation to peanut is 1.3%10) we applied a validated questionnaire to a large nationwide cohort of subjects allergic to peanuts. Fifty children with reported peanut allergy and their families, all local to Southampton, were studied in more detail with skin prick testing. The study was approved by the regional ethics subcommittee. Subjects comprised (a) a panel of 80 local people (mainly children) known to have peanut allergy and known to us together with other people referred by general practitioners for evaluation of suspected or proved peanut allergy; (b) people referred through the Anaphylaxis Campaign (a national charity); and (c) people who contacted the study coordinator after having seen details of the study in national newspapers and magazines. Between December 1994 and December 1995 all the subjects (n = 833) were sent a questionnaire in which simple questions were asked about the presence of a particular symptom or disease—for example, “Do you have asthma? (yes/no)” and “Please tick if the following reaction occurred: vomiting (yes/no), rash (yes/no), face swelling (yes/no).” By 1 January 1996, 691 (82.9%) questionnaires had been returned. Reactions that were thought to be unusual in peanut allergy—for example, headache, joint pains, or unilateral weakness—were followed up by telephone inquiry to determine whether these symptoms were likely to be due to peanuts. After the questionnaires were reviewed by a single, experienced clinician (JO'BH), 69 (10.0%) subjects were excluded: 9 subjects had negative results on challenge with peanuts, 10 had never eaten peanuts, 24 were allergic to some nuts but not peanuts, 7 declined to participate further in the study; in 9 cases the unanswered questionnaires were returned marked “not known at this address” or “has moved,” and 10 subjects gave other reasons. The remaining 622 questionnaires, reporting typical symptoms and features of peanut allergy, were considered to have been submitted by people who were genuinely allergic to peanuts. The typical features of peanut allergy were sought with “yes/no” questions about reaction—that is, the presence or absence of rash, angio-oedema, wheeze, cyanosis, and collapse. We investigated reported rates of atopy and allergy in probands allergic to peanuts, their siblings, and the two preceding generations (parents, aunts, uncles, and grandparents). Information was also gathered about rates of the mothers' consumption of peanuts while pregnant or breast feeding. We evaluated 50 local children with apparent peanut allergy and their available first degree relatives by interview with the same questionnaire and skin prick testing. Forty nine mothers, 48 fathers, and 45 siblings participated. We obtained written personal consent, when appropriate, from all competent children and written parental consent on behalf of younger children in all cases. We calculated sample size for the family survey using the statistical software EpiInfo 6, version 6.03 (World Health Organisation, Geneva). Assuming an expected frequency in the population of 1.3%10 and a maximum acceptable deviation of 3.5%, a sample size of 33 gives 90% confidence, and a sample size of 46 gives 95% confidence. Standard commercial skin prick testing solutions were used (1% histamine positive control, 0.9% saline negative control, egg, milk, pea, soy, cod, house dust mite, and grass (SmithKline Beecham, Welwyn Garden City) and peanut, brazil nut, hazelnut, and walnut (Miles, Elkhart, Indiana)). Positive results were taken as a weal of 3 mm or greater in the presence of a positive response to 1% histamine of 3 mm or greater and no response to the negative control (0.9% saline). Data were doubly entered into an SPSS for Windows software package (SPSS, Chicago, USA) by a commercial data handling company. McNemar's χ2 testing has been used for analysis of concordance of symptoms between pairs. Yates's correction with 1 degree of freedom was used for analysis of two sets of categorical data on individuals. Two tailed P values are used throughout at a 5% significance level. Spearman's rank correlation was used to correlate non-parametric continuous variables on individuals. In all, 622 (74.7%) questionnaires were analysed. Probands were divided almost equally between the sexes (314 male, 308 female); 205 (32.9%) probands were 5 years old or younger, and 202 (32.5%) were aged between 6 and 16 years. There were 215 (34.5%) adults (aged over 16 years). It was assumed that parents completed questionnaires for subjects under 18 years. Adult subjects were assumed to have completed personally all parts of the questionnaire. Table 1 shows that all forms of atopy, except shellfish allergy, were significantly more common in probands allergic to peanuts than in any other family member. When asked “do you have any allergy?” mothers said “yes” more often than fathers (332/609 (54.5%) v 277/609 (37.3%), P<0.005). McNemar's χ2 analysis of parental concordance showed that asthma was more commonly reported by mothers than fathers (χ2 = 20.543, P<0.0001, 95% confidence interval 1.71 to 4.3, odds ratio 2.67). Similar results were found for eczema (34.63, P<0.0001, 2.18 to 5.32, 3.36), hay fever (55.86, P<0.0001, 2.5 to 5.26, 3.59), and non-specific food allergy (48.76, P<0.0001, 2.76 to 7.0, 4.33). Atopy was more common in maternal relatives of allergic subjects than paternal relatives. A greater proportion of maternal aunts and uncles (237/607 (39.0%)) than paternal aunts and uncles (140/606 (23.1%)) reported atopy (26.5, P<0.0001, 1.57 to 2.86, 2.11). Peanut allergy was reported increasingly by successive generations. Three grandparents (out of 2409 valid replies) reported peanut allergy compared with 26 reports of peanut allergy from 2428 parents, aunts, and uncles (P<0.0001). In total, 42 out of 609 (6.9%) siblings of subjects with peanut allergy reported the allergy (compared with parents, aunts, and uncles, P<0.001). This rate of peanut allergy in siblings of probands is significantly higher than the rate of nut allergy (peanuts and tree nuts) reported in the High Wycombe study,11 where 182 reports of perceived allergy to tree nuts or peanuts were found in a population of 10 552 (1.7%, P<0.0001). Siblings had hay fever as commonly as their peanut allergic probands (χ2 = 2.68, P = 0.1, 95% confidence interval 0.94 to 2.0, odds ratio 0.73) but asthma less often (34.5, P<0.00001, 2.1 to 4.9, 0.73) and less eczema (8.93, P = 0.003, 1.21 to 2.63, 0.56). The prevalence of atopy increased significantly through the generations, with grandparents less often reporting atopy than their children (parents, aunts, and uncles) (P<0.0001). In turn, parents, aunts, and uncles less often reported atopy than children (subjects with peanut allergy and their siblings) (P<0.0001). When analysed for individual atopic phenotypes siblings had significantly higher rates of the following allergies than their mothers (generally more atopic than fathers): peanut allergy (6.92, P<0.007, 1.26 to 6.25, 2.7); nut allergy (2.7, P<0.01, 0.92 to 3.03, 0.6); milk allergy (11.11, P = 0.00005, 1.87 to 2.2, 5.5); egg allergy (16.96, P<0.0001, 2.98 to 104, 12.5); asthma (57.3, P<0.0001, 3.33 to 9.45, 5.49); eczema (62.8, P<0.0001, 3.54 to 10, 5.9); and hay fever (7.4, P<0.006, 1.14 to 2.41, 1.66). Significant differences were also found when each atopic phenotype was analysed in isolation across the generations—for example, in hay fever grandparents versus parents, aunts, and uncles (P<0.0001) and parents, aunts, and uncles versus probands and siblings (P<0.0001). Although this study did not control for recall bias, mothers of younger probands (5 years old or younger) were significantly more likely than mothers of older probands (17.25, P<0.005, 1.45 to 2.97, 2.1) to have eaten peanuts regularly while pregnant or breast feeding (table 2). A significant inverse correlation (r = -0.6, P<0.0001) existed between age of onset of peanut allergy and year of birth—that is, the older a subject is now, the older he or she was at the time of first allergic reaction to peanuts (fig 1). The families of 50 children reported to be allergic to peanuts (29 male, mean age 5 years) underwent skin prick testing. Seven (14%) probands were found to be negative to peanut. Five of these were proved not to have peanut allergy by open challenge12; one subject refused challenge; and one was lost to follow up. Reported rates of atopy and allergy in the remaining 43 families differed only slightly from the larger group. Probands allergic to peanuts had a significantly lower rate of reported allergy to tree nuts; mothers and fathers reported significantly more hay fever, and mothers reported significantly more asthma (table 3). This may reflect the younger age of parents because this group was established from only local children allergic to peanuts. Two families had two children with peanut allergy, confirmed by history and skin prick testing. A further three families had a proband and a sibling with a positive result on skin prick testing, but only one sibling was proved to be allergic on the basis of a standard challenge. One father had a positive result on testing for peanut, but he declined challenge, reporting no problems after peanut consumption (table 4). Nine (21%) of the 43 probands reported allergy to tree nuts, but only five of these (12% of total group) had a positive result for a tree nut on skin prick testing. A further nine were positive for a tree nut, despite not reporting allergy to tree nuts. In total, 14 (32%) subjects with peanut allergy had a positive result on skin prick testing for tree nuts. Three mothers (6%) had a positive result for a tree nut in the absence of any known nut allergy. Only one subject with peanut allergy reported soy allergy and had a positive result on skin prick testing for soy. Four others who did not report soy allergy also had a positive result for soy. No subject with peanut allergy reported other legume allergy, and only three had a positive result for the common pea. Peanut allergy is apparently more common than has been realised. Our results suggest that this increase in reported cases reflects a true increase in incidence, with significant differences in peanut allergy in successive generations—three out of 2409 grandparents, 19 out of 1218 parents, 42 out of 609 siblings. The increase of peanut allergy through the generations probably reflects a general increase in reported atopy as shown by the significantly higher prevalence of all phenotypes of atopy in children compared with parents and in parents compared with grandparents. Peanut allergy is more common in siblings of those with peanut allergy than in the general population. The allergy seems to be an increasingly common manifestation of an allergic diathesis and is apparently inherited more strongly through the maternal line. Mothers of allergic children are known to overreport personal atopy and conversely to underreport paternal atopy.13 The rates of atopy in this large cohort, however, were broadly similar to the rates reported in the families in which the questionnaire was applied to each family member by a single physician. Mothers were more than four times as likely as fathers to report food allergy. The differences in rates of some atopic phenotypes, such as hay fever and allergies to egg and shellfish, are probably accounted for by an age effect, with eczema and egg allergy more common in younger children and hay fever and shellfish allergy more common in adults. Peanuts are a common food, especially for children and young adults. In non-allergic individuals peanuts are rightly seen as a healthy, wholesome source of protein and energy. The secular increase in vegetarianism and the influence of North American popularity of peanuts and peanut butter as finger foods for small children may be making peanuts a more common part of the normal diet. This in turn may account for the perceived though not yet objectively documented increase in prevalence of peanut allergy. Our data suggest, however, that this is a reflection of a general increase of all atopic phenotypes. It has been suggested that before first exposure to peanut foods some infants have been sensitised to peanut by infant milk formulas that contain peanut protein or peanut oil.8 In our questionnaire survey a reaction on first known exposure to peanuts was reported in 80% of subjects under 5 years old,14 implying prior, occult sensitisation. Our simple survey of peanut consumption during pregnancy and breast feeding by mothers of these children with peanut allergy may suggest that they are being exposed to peanut allergens in utero or via breast milk. This may account for the earlier age of onset in younger subjects. People with peanut allergy are generally advised to avoid tree nuts, either because of a perceived or real allergy to tree nuts or because peanuts are sometimes disguised as other, more expensive nuts.18 Our results showed that up to 50% of self selected and referred subjects with peanut allergy (adults and children) reported allergy to one or more tree nuts. Our skin prick testing of the local group of patients has shown, however, that such testing for tree nuts in children with peanut allergy, has a maximum sensitivity of only 55%. The group of children who were tested, however, were younger and their reported rate of nut allergy was significantly lower than that of the entire cohort. It seems that because of fears of inhalation of nuts or nut fragments children are not given other types of nuts as often as they are given products that contain peanuts, such as peanut butter; only hazelnut is commonly used as a sandwich spread. The higher rate of peanut allergy in the siblings of people with peanut allergy compared with the general population (7% v 1.3%) probably reflects similar early exposure of offspring of atopic parents to peanuts. Peanut allergy is rarely an isolated manifestation of atopy. It is more common than has been appreciated, and its prevalence is apparently increasing. We thank Miss C Bicknell and Mrs L A Gudgeon for administrative and secretarial help. Funding This work was supported by a grant (to TPD) from the Ministry of Agriculture, Fisheries and Food. Conflict of interest JO'BH is funded by the Seed Crushers and Oil Processors Association. .Changes in asthma prevalence: two surveys fifteen years apart.Arch Dis Child1989;64:14526. .Increase of asthma, allergic rhinitis and eczema in Swedish schoolchildren between 1979 and 1991.Clin Exp Allergy1995;25:8159. .Increase in hospital admissions for childhood asthma: trends in referral, severity and readmissions from 1970–1985 in a health region of the United Kingdom.Thorax1989:44:6149. .Genetic basis of IgE responsiveness: relevance to the atopic diseases.Int Arch Allergy Immunol1995;107(1–3):25–8. .HLA genetics and allergic disease [editorial].Thorax1995;50:8158. .Fatal and near-fatal anaphylactic reactions to food in children and adolescents.N Engl J Med1992;327:3804. .Risks of milk formulae containing peanut oil contaminated with peanut allergens in infants with atopic dermatitis.Pediatr Allergy Immunol1994;5:1848. .Is deficiency of interferon-gamma production by allergen triggered cord blood cells a predictor of atopic eczema?Clin Exp Allergy1994;24:2330. .Control study of peanut and tree nut sensitisation by age of 4 years.BMJ1996;313:5147. .A population study of food intolerance.Lancet1994;343:112730. .Proposals for standardisation of oral food challenge tests in infants and children.Pediatr Allergy Immunol1994;5:113. .Prediction of atopic disease in the newborn: methodological aspects.Clin Exp Allergy1990;20(suppl 3):21–26. .Age of onset and reported symptoms in 500 peanut allergics [abstract].J Allergy Clin Immunol1996;97(1,part 3):239. .Effect of allergen avoidance in infancy on allergic manifestations at age 2 years.J Allergy Clin Immunol1994;93:8426. .The development and prediction of atopy in high-risk children: follow-up at age 7 years in a prospective randomized study of combined maternal and infant food allergen avoidance.J Allergy Clin Immunol1995;95:117990. .The natural history of peanut allergy.J Allergy Clin Immunol1989;83:9004. .Immunoassay of peanut allergens in food-processing materials and finished foods.J Allergy Clin Immunol1990;86(1):41–4. .Allergenic cross-reactivity among legume foods–an in vitro study.J Allergy Clin Immunol1987;79:4338.